With its optical recognition feature, Aruspix acts as a unique music scanning software for early music prints. Aruspix also has the particularity that it learns and improves itself dynamically as soon as a page is processed and corrected by the user. 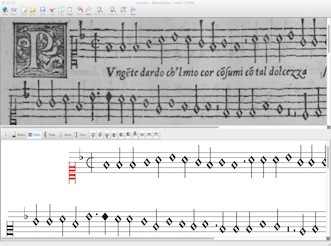 With its superimposition and collation features, Aruspix acts as a tool for music editors in order to compare early music editions and re-editions when compiling comprehensive critical modern editions. Aruspix is a software application developed in close collaboration with the Marenzio project, an editorial project that aims at making available for the first time, and online, a complete critical edition of the secular music of Luca Marenzio (ca. 1553-1599). It is also developed in collaboration with the Music Encoding Initiative (MEI), a community-based effort for defining a schema for music notation encoding. For more information about Aruspix, please contact Laurent Pugin.